After the horrors of Double Zeta Gundam I was excited to watch the final chapter of Tomino’s Universal Century Gundam franchise. 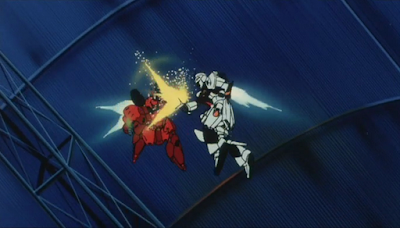 Char’s Counterattack takes place three years after Double Zeta and about thirteen years after the original series. Char returns from hiding with a newly created Neo Zeon force carrying an asteroid with them. With the goal of rendering the Earth uninhabitable, Char sets to drop it on the planet but Amuro Ray, Captain Bright, and the elite Federation Forces team Londo-Bell are dead set against stopping them. The movie doesn’t waste any time getting into the action. 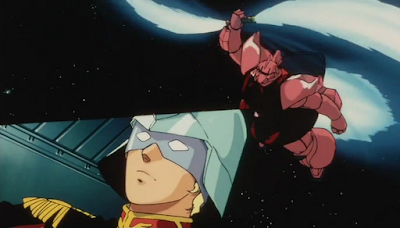 The first scene shows the unveiling of Nu Gundam, whose construction had to be accelerated because of the appearance of Char and his Neo Zeon army. Following that, Amuro Ray battles against Char’s forces while attempting to stop the astroid from falling on Earth. While the conflict rages just above the planet, the Federation Forces admit to being powerless against the oncoming asteroid. The set up of this movie contains most of its problems. That opening scene doesn’t quite make any sense. For starters, this is the first we’ve heard that Char is alive! He was assumed dead at the end of Zeta Gundam, killed in the final battle against the Titans. 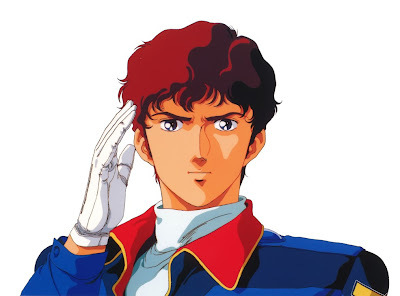 Second, Amuro Ray was retired from military service, which was covered in an arc of Zeta Gundam. If Amuro wanted to fight again why didn’t he just return to the Argama when Kamile was put out of commission, or even before, and pilot the Gundam? It feels like the movie begins twenty minutes after it should have because the audience is missing some important pieces of information. The film disguises plot devices with some serious commentary on politics. The Earth Federation doesn’t want to get into another war after what Earth has been through during the Zeon conflict from the original series and the Neo Zeon conflict in Double Zeta Gundam. This blinds them and they completely believe and give in to Char’s demands after he drops the initial asteroid on Earth. However, the deal feels more like satire than desperation because in exchange for Char agreeing to disarm, Earth gives him the massive asteroid base Axis. They give a man who just dropped a giant rock on Earth an even bigger rock which he can drop onto the Earth! That’s exactly what he does, too. He barely hesitates! He sends a a handful of dummy ships to where the Federation was waiting to disarm Neo Zeon and then tosses Axis right into planet Earth. So while yes, Tomino is commenting on politics and how desperate the Federation was to stay out of the war it also works as a plot device to give Char the weapon he needs to destroy Earth. I’m not quite sure which way the scene favors. The film goes on to introduce three new characters Chan Agi, a female pilot under Amuro who becomes the main love interesting in the film, Quees Panya, the daughter of a high ranking Federations Forces officer, and Hathaway Noa the son of Captain Bright Noa. Chan is a capable pilot who grounds Amuro emotionally and she is quite enjoyable to watch. However, the other two are plain annoying. Especially Quees, who quickly sympathies with Char’s goals and betrays the Federation Forces to join him. She is a Newtype prodigy, and Neo Zeon takes advantage of her to pilot a new Mobile Armor. I don’t have much to say abut Quees except that she doesn’t serve much in the film except to fulfill a theme of corruption. 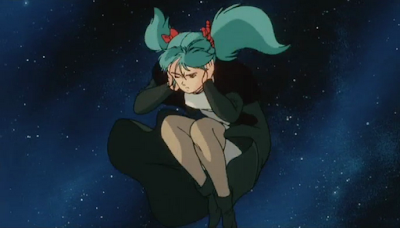 She sympathizes with Char using fuzzy logic. This line appears in the Bandai subtitled version:“I’m with him! People on Earth are so stubborn and conservative but don’t have a problem changing wives or husbands! 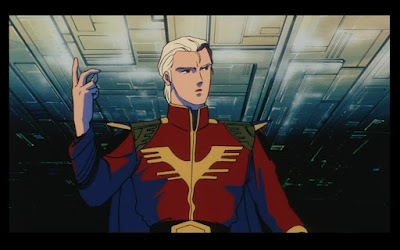 And that’s why I think Char is trying to do what he can to bring out the potential of humanity.” Which shows that the character really doesn’t know what she is getting into or why exactly she was getting into it. Once that is established, the audience is treated to Char just taking advantage of this naive girl. Beyond that, it’s annoying that she enjoys being used by Char and gets away with whatever she wants. 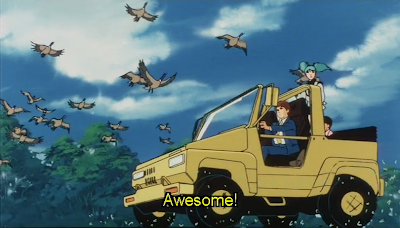 At one point in the film she steals a Mobile Suit and finds Char out in space, then opens the cockpit and rolls through open space while holding her nose with no space suit. At that point, I just declared Tomino was using this character to annoy the audience. In reality, she is supposed to be another Lalah Sune, a young girl corrupted by Char, but this time Char has no emotional attachment to the poor girl. Hathaway Noa had become attached to Quees during the fifteen minutes they spent together and makes it his goal to make her see reason. During the final battle above earth, he ends up getting in the way and causing far more damage than doing help. His actions end up killing allied pilots who would have survived otherwise and doesn’t help in saving Quees, who pays the ultimate price for her betrayal and naiveté. Hathaway Noa becomes the standard Gundam character. This film is filled with veteran pilots and soldiers where the themes of Gundam traditionally come from inexperienced soldiers going into battle. Hathaway goes into this war as a child and comes out having seen one of the most horrible battles in human history, seeing someone he cared about killed, and being responsible for the death of a comrade. He becomes the audience stand in and, even though he lacks much characterization, is relatable because of that. The question why we needed to have the novice soldier in this film is what bugs me. This should be a film filled with people who have survived through the previous two wars and are ready to put everything to rest, or not in the case of Char. Instead Tomino uses Hathaway Noa as a tool to continue telling the one story he seems to recycle over and over again, that of a young man walking into the horrors of war. It isn’t needed in this film, and it distracts from the main point of the film, the final battle between Amuro and Char. Char’s motivation is never really made solid to me. Most of the options given as to why he is attack Earth are speculation, and in terms of narrative consistency there are no details on how he produced an army of mobile suits or gained control over Neo Zeon after they were all but destroyed at the end of Double Zeta. He always had the “Space should rule over Earth” aspect of his character but I would have liked to see how exactly he became such a radical. A slight hint that Lalah’s death was eating away at him and driving him crazy isn’t enough. Amuro suffers from the same problems. He is simply Amuro. He pilots the Nu Gundam, which he also designed, he is legendary and awesome. I never got a sense of the man he became after all these years. Zeta Gundam did a good job of moving the character forward and now we see him again and it feels like even the development exposed in Zeta Gundam is ignored.The film presents Char’s motivationit matter-of-factly, I never really buy it considering the history with the characters. Char wants Amuro dead because of the death of Lalah Sune. Even after all these years he still loves her, and still resents her picking Amuro over him at the end. He also goes on about how human being’s souls are tied down by gravity and how Earth will always ignore the needs of people in space, and all of this justifies mass genocide, apparently, because once the Earth Government is moved to Space they won’t be bitter that their home and families were annihilated by a radical splinter group. The best part of the film are the animation and action scenes. This movie was made in 1988 and the animation and mech battles rival anything made since. The mech designs are fantastic, the fights are breathtaking, and the one on one duel between Amuro and Char is worthy of going down in animation history. That final duel is almost perfect, except for one scene where they both get out of their mechs for no reason. The battle uses everything we love about Gundam and pushes it to an extreme without using any of the silliness that tainted some of the final battles from previous UC Gundam series. This is what the movie was made to showcase, it’s what Gundam fans have wanted since the original series. The rematch finally comes and it’s glorious in every respect. Then comes the end. Axis is blown apart but half of it is still falling towards Earth. Amuro moves to attempt to stop it’s descent using the Nu Gundam and its Psyco-Frame. Suddenly Federation reinforcement arrive and all help, then Zeon mobile suits join in to help. But that isn’t enough and all of them are forced to retreat. It’s then that Char realizes the warmth of the human heart, even in someone willing to destroy the Earth. That realization causes him to renew his faith in humanity and that combined with the Psyco-frame’s resonance, pushes Axis away from the Earth. Yet, Amuro and Char never reappear. So after all that, Char simply changes his mind and that’s enough to reverse everything that he put into motion. Sure, he had the aid of a magical Mobile Suit system but …it’s still a little disappointing. Maybe if I had more of a sense of Char’s character before this realization made the difference in the fate of planet Earth it would have been more believable. It’s presented as epic and rational, but it feels cheap because of my lack of truly understanding these characters. I wanted to love this movie. But the annoying side characters and subplots just dragged it down, as well as a lack of a cohesive narrative and characters who had proper motivation. However this film is a must see for fans of mecha combat and anyone who has ever enjoyed a Gundam series. In the end, it’s visuals and action are stunning to behold and it’s the that final battle between the original protagonist and antagonist of the Gundam franchise that has made this film a classic. For all its flaws it wasn’t a bad watch and I kind of look forward to seeing the film again not only for the action sequences but to further deconstruct how the themes reflect post-war Japan and Tomino’s ultimate message about war. Through my watching of UC Gundam there has been a duality to the various parts of the franchise. The first is great action and a compelling world on the brink of destruction. The second is incomprehensible character decisions, poor plotting, and Newtype “magic” as a solution to problems. Yes, the second one seems to out weight the first overall, but that is just one of the elements you’re signing up for when approaching Gundam.